Risotto makes my heart smile. 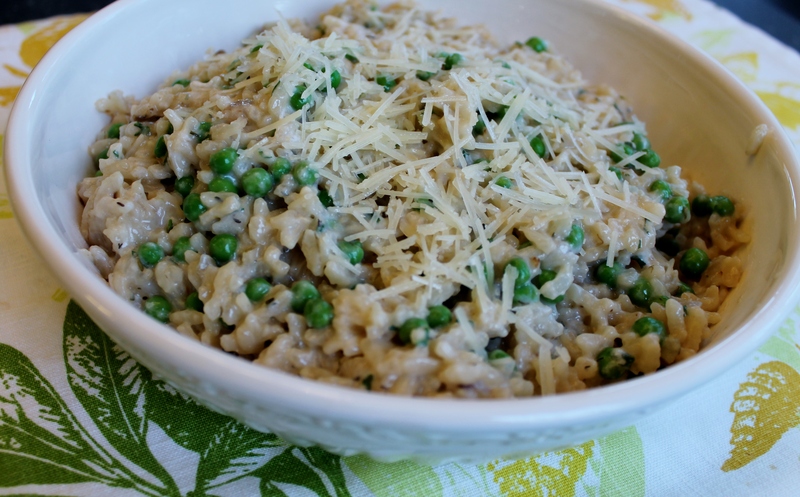 This rich and creamy classic Italian rice dish can be prepared many ways using the freshest ingredients. 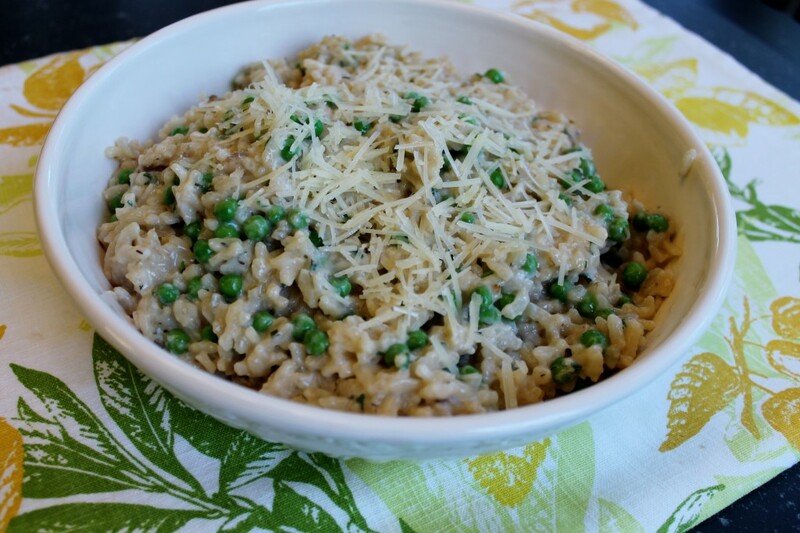 Cooking risotto is time-consuming which turns many people off from preparing it at home but trust me when I say it is easy to make. It mostly involves lots of stirring as you wait for the liquid to absorb but it is worth every minute spent. Since you are already cooking with wine pour yourself a little extra to sip on while you stir. You can easily switch out the peas in this dish to add other seasonal vegetables for a filling and flavorful meal. 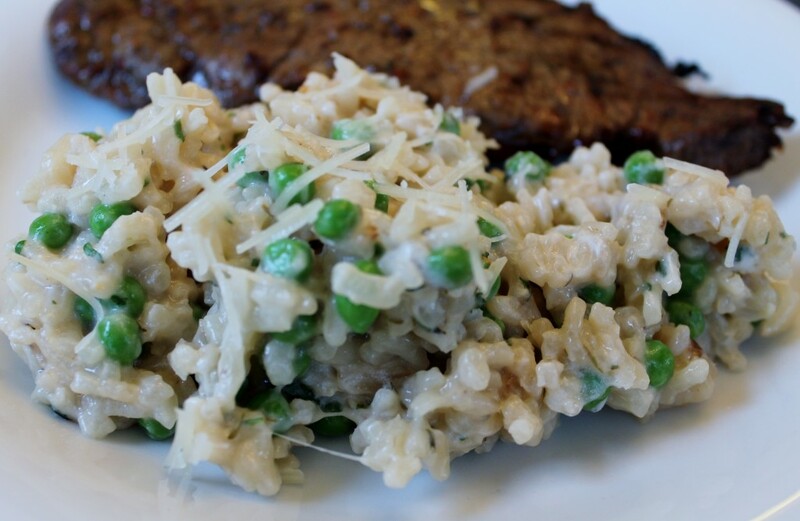 The Greek yogurt gives the risotto the creaminess we all love without all of the fat and calories typically found in other risotto dishes. This makes a wonderful vegetarian meal if you use vegetable broth or serve as a side along with chicken or steak. – Bring the chicken broth, and 3 1/2 cups water to a simmer in a saucepan over medium heat. Cover, reduce the heat to low and simmer 20 minutes; Keep warm. – Heat the olive oil in a large saucepan over medium heat. Add the shallots and cook, stirring until soft, about 3 minutes. Add the rice and cook, stirring, 2 more minutes. Add the wine and cook, stirring, until evaporated, about 2 minutes. Add 1/2 cup warm broth and stir constantly until absorbed. Repeat, adding the broth in 1/2-cup increments and stirring constantly, until the liquid is absorbed and the rice is just tender and creamy, 20 to 25 minutes. Add the peas and stir until heated through, about 1 minute. Remove from the heat. – Combine the parsley, chives and thyme in a bowl. Add the herbs to the risotto along with the grated parmesan and yogurt; stir until creamy, about 1 minute. Divide the risotto among bowls. Top with more parmesan.